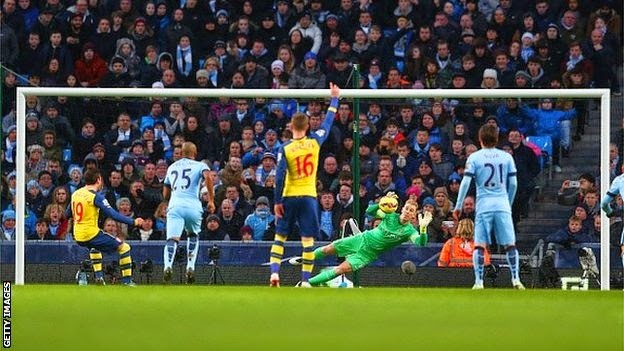 Manchester City beaten 2 - 0 by Arsenal at their home ground Etihad Stadium, and make it the first Arsenal win at City home ground since October 2010. City and Arsenal played out a thrilling 2-2 draw when they met at Emirates Stadium in September 2014 but this time it was different as the home boys were defeated. Cazorla converted a first-half penalty after Vincent Kompany fouled Nacho Monreal. Manchester City are now five points behind leaders Chelsea, after Chelsea managed to beat Swansea 5-0 at the Liberty Stadium on Saturday.